For the Midwest, high-speed rail is not only feasible, it is essential. The Midwest High Speed Rail Association is studying a business plan that will show how high-speed rail is the most effective investment to unlock economic development and growth within our communities and region. Our Midwest high-speed network business plan will identify the high-speed segments that will bring faster trains to a range of destinations and political interests. The Midwest high-speed rail business plan relies on the Phased Network Approach. This approach has created successful high-speed rail systems around the world, and it’s the key to building the broad base of political and financial support we’ll need to invest in our Midwest high-speed network. The Phased Network Approach lets one new segment of high-speed line enable faster trains to a broad number of places. Because it connects to and enhances our existing railroad network, a new segment of high-speed line in one state will also directly benefit neighboring states. Our Midwest network business plan will unite political interests across boundaries and bridge the urban-rural divide. Outdated safety regulations also prevent the Phased Network Approach from working in the United States. New regulations, proven safe around the world, will allow high-speed trains to travel at very high-speeds on dedicated track and operate at slower speeds on existing track. These new regulations will make all trains safer, more cost-effective and more attractive to passengers. Our business plan will prove that the Midwest needs high-speed rail, and the Phased Network Approach is the way to build it. We need your support to complete the study. Ready to ride modern trains in the Midwest? Donate today and be part of making the vision a reality. The Midwest High Speed Rail Association is identifying the high-speed segments that will make the best investments for our region: those that will enable fast, frequent trains to a variety of destinations large and small. Our Midwest network will start with one high-speed segment, at least 100 miles long. High-speed rail systems around the world have been developed and expanded in phases, blending into and taking advantage of the existing passenger rail network. They are highly integrated with transit systems, intercity bus lines, and airports. Sometimes they share track with freight trains. A high-speed line is not a system unto itself, but rather an essential part of a much bigger transportation framework. Prevailing assumptions about high-speed rail in the U.S. are fatally flawed. The essence of high-speed rail is robust interconnectivity and frequency: serving as many travelers as possible with each investment. And yet, most discussion regarding high-speed rail in the U.S. has focused on the “100–500 mile sweet spot,” a presumed optimal distance between two large cities. The promise of high-speed rail cannot be evaluated by only studying the ridership between two end-point cities, nor by considering each city pair to be a separate, stand-alone market. This approach overlooks the benefits of a highly interconnected network that provides reliable travel between many places. Networks transform the potential of each individual segment, so that the whole is greater than the sum of its parts. Passenger rail planning in the U.S. needs to abandon its preoccupation with city pairs and focus instead on networks. Design each investment to serve as many people as possible, and the neccessary political support will follow. This seems simple, but railroad planning in the U.S. is stymied by fragmented jurisdictions and funding streams. Decisions about commuter trains, regional trains, national trains and freight trains all happen separately. People's travel needs are not neatly divided into these categories, and as a result, many potential trips are missed by planning models. Planning passenger rail as part of a broader network, instead of disconnected corridors, serves a bigger market. Gaining the most traffic to support each new piece of infrastructure requires gathering people from far and wide. That means creating strong links to connecting services. High-speed rail is not a system unto itself, it is an essential part of a much bigger transportation framework. Fast trains are the most effective when their schedules, fares, and physical connections are closely coordinated with other trains, transit, buses, and airports. The attractive force of high-speed rail reaches greater distances than conventional passenger rail service. The increased demand justifies branch lines that connect farther flung communities to the high-speed lines and the network. Once in place, those branch lines make possible additional commuter or regional services that would not be viable without the traffic resulting from the high-speed sections. Fast trains from Chicago to Indianapolis could produce enough ridership to make branch lines radiating out from Indianapolis to Bloomington, Louisville, and Muncie feasible. Travelers from those cities could reach Chicago faster and more affordably than by car or airline. 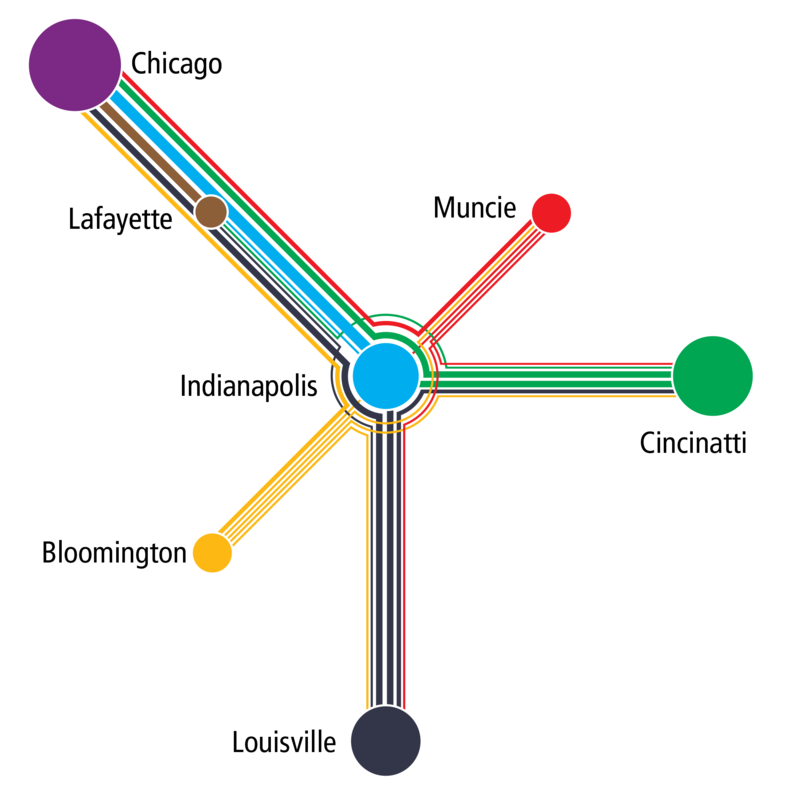 Those branch lines could also host commuter and regional services that would connect those cities to Indianapolis and each other. We know that the Midwest needs high-speed rail. We know how to make it happen. We just need to identify the best place to start. Your contribution will make this study happen.